I Skate, Therefore I Am: Great Desert Pool Duel contest results. The Great Desert Pool Duel Contest took place out at Billy Runaway’s Palmdale, California residence last week-end with newly remodeled shallow end steps to his giant left hand kidney bowl and a good mix of riders going at it all afternoon. The first annual Great Desert Pool Duel Invitational is over. The contest was upon invitation and closed list and some of the skaters that showed up were Al Brunelle, Jack Given, Kevin Burke, Jack Reuter, Ben Raybourne, Kevin Kowalski, Ryan Johnson and Tristan Rennie (see the whole list below). A sweeper disaster sent Al Brunelle into the black but he seemed to be OK after one day of resting. Al Brunelle landed 2nd at the Vans Combi Pool Classic early January 2012. You can watch here an eraly video of Al Brunelle. The big winner of the Great Desert Pool is Tristan Rennie who amazingly managed to beat Kewin Kowalski and Ben Raybourn with an uphill battle. Tristan Rennie is not new in the little world of pool and bowl skateboarding. He is the protégé of Salba and actually rides for SalbaCruz (a division of Santa Cruz). He won a couple of remarkable contest in 2011 (at Upland) and 2012, and landed 3rd at the Ams Combi Pool Classic at the Vans Skatepark in January 2012. With the Great Desert Pool Duel win today, Tristan Rennie is showing that dedication and consistency are the best tools you can use in skateboarding. If you want to see Tristan Rennie in action live, go to Upland skatepark on May 19: the Hoffman family along with Utility Board Shop is throwing a 35th anniversary Pipeline Reunion. It will be day of skating followed by a commerative plaque being giving to Stan Hoffman who is now 82! Honoring the tradition of Pipeline Skatepark and the Badlands. Also, watch this video of Tristan Rennie that was done during Salba’s birthday at Chino Skatepark . 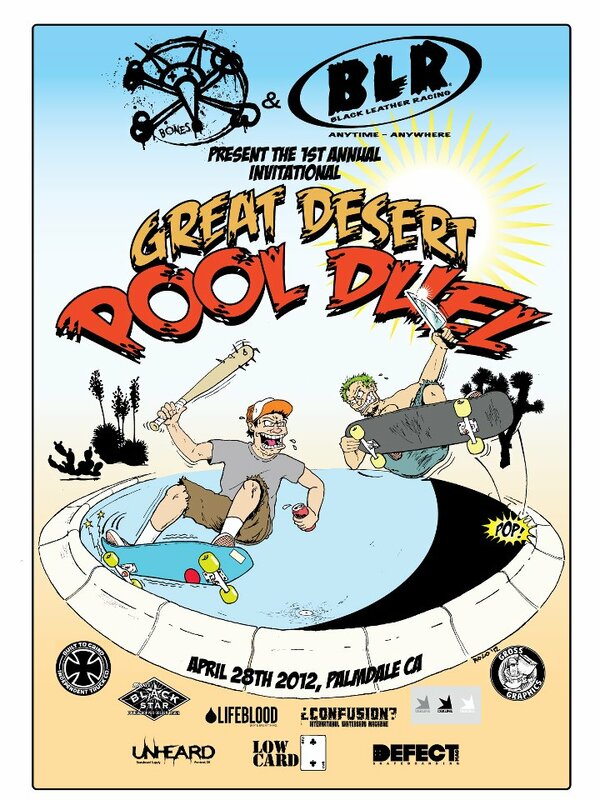 The first annual Great Desert Pool Duel Invitational sponsors were Bones Wheels, Black Leather Racing, Black Star Beer, Defect Magazine, Independent Trucks, DEKLINE Foowear, Lifeblood Skateboards, Gross Graphics, Lowcard Mag, and Confusion Mag.... There is an in depth coverage of the event, including awesome pictures by Brandon Wong -as always- on Radballs. List of contestants at the 1st Annual Great Desert Pool Duel : Tom Remillard, Div Adams, Rob Russo, Patrick Ryan, Jake Reuter, Kevin Kowalski, Ben Raybourn, Mason Merlino, Al Brunelle, Josh Borden, Jerry Gurney, Ryan Johnson, Brad McClain, Tristan Rennie, Kevin Burke, Jake Reuter, Steve Reeves.